This summer I was given a kayak to take care of while its owner is out of town for a year or so. He told me to use it as much as I want and I finally made it out on my second paddle today. The forecast for was partly cloudy skies and light winds. If anything, the actual weather was better than that. It was a little chilly as I got things out, but once I was down near the water, the combined warmth of the sun’s direct and reflected rays was enough to keep me pleasantly warm. When I got down to the beach, the Sheldon Jackson College introductory sea kayaking class was preparing to embark on a day trip. I got out in the water before they were ready and paddled a short distance away to look at the Fork-tailed Storm-petrels that were flying nearby. As I headed out, I heard an expulsion of breath behind me that sounded like it was a little closer than I might prefer. I turned to look and sure enough, there was a large sea lion. It was not actually very close, but it’s easy to feel intimidated while sitting in a kayak when an animal that large is swimming nearby. It’s hard to imagine what it would be like if a truly large animal like a whale came up near where I was paddling. The sea lion swam further out in the bay where it was joined by a second and they leisurely consumed a late breakfast of fish. As they splashed around, several gulls flew in to clean up the scraps. After paddling out in front of the Crescent Harbor breakwater, I decided to turn around and join the class for a little while. As I paddled back to where they were waiting for all the people to get in the water, I saw a bird I did not recognize. I tried to get a couple of pictures before it tired of my approach and swam off. A little later I realized it was probably a Pigeon Guillemot. I paddled with the class across Crescent Bay to the islands. From there they went through the islands on their way to Aleutkina and I spent a few minutes just sitting and relaxing in the warm sunlight before crossing back towards Indian River. Fortunately, motor boat traffic was very light and the sounds of town were distant. The warm sun, calm water, and quiet was a welcome respite from the cool rain and noisy rushed hustle and bustle that have characterized much of my life for the last few days. As I approached the cove into which Indian River empties, I saw many ducks, Scaups, Scoters, and Harlequins primarily. I was trying to approach them slowly to get a better look and maybe some photos, but they were spooked by another kayaker who had launched from Eagle Way beach. She approached me thinking that I was her paddling partner, but I wasn’t. From there I paddled up into Indian River. I made it up into the upper part of the estuary, before turning back and drifting back out. It seemed like the birds were not quite sure what to think of me, especially if I was not paddling. They definitely seemed to be more tolerant of me in a kayak than if I had been walking on the beach. By the time I came back out from the river, some of the ducks that had flushed previously began to fly back. I thought I would try to get a little closer to them by approaching from a direction where I could mostly drift slowly closer. To this end, I crossed the cove and paddled out a little way. My ability to read current and wind are poor, and this approach was not too successful. I did get close enough that I was able to identify the Greater Scaups and many of the Surf Scoters. There were some other scoters that I was not sure about however. For the next hour or so I alternately sat and drifted to watch birds and paddled to gradually make my way back toward Sage Beach. During this time, I had a seal check me out. Seals tend to be quite a bit more subtle than sea lions, and it was much less intimidating to have the seal approach me than it had been to see the sea lion earlier. One of the main motivations for getting out on the kayak was to try photographing the Storm-petrels. I saw many of them, a couple even flying close enough that I just about could have grabbed them. Unfortunately, between their small size, quick flying, and gentle rocking of the kayak, it was very difficult to keep the birds in focus when they came close. The times they did approach from a direction I might have been able to keep up with I had the camera stashed (it’s definitely not waterproof). Other times they just did not happen to circle by in an optimal way. I did get some photos, but they were all so blurry that I did not keep any of them. As I was heading back in, I tried drifting up to Sage Rock to see how the birds there would respond. There were cormorants, gulls, Harlequin Ducks, Surfbirds, and Black Turnstones on the Rock. None of them flew off until I was quite close. 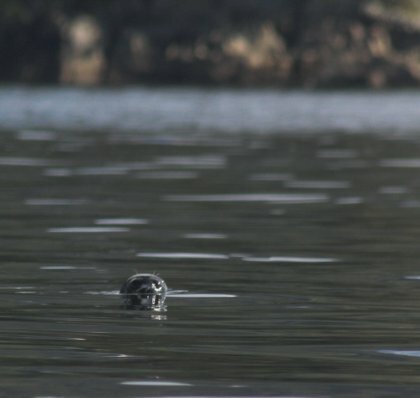 They seemed curious about me, but let me get far closer than I have ever managed to get when I have tried to approach from shore. Finally I waited off Sage Beach a little bit to soak up a little more sun before Melissa and the kids came down to the beach to see me in. This entry was posted in activities, birds, kayaking, marine, photo. Bookmark the permalink.